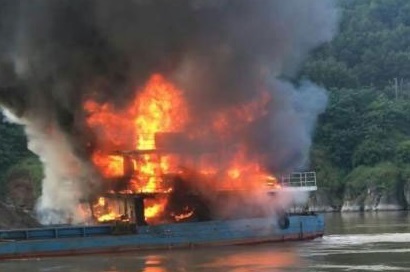 The general cargo ship Sheng Yuan 508 caught fire during a voyage in Yangtze river in Chongging area. The fire erupted in the superstructure and quickly engulfed all accommodation areas and engineering. The crew was unable to get control over the flames and requested assistance from the local authorities. The Master of the general cargo ship decided to change course outside the fairway and pushed the vessel to shallow water and grounded. The vessel hardly stuck into a sandbank and crew was able to abandoned without serious injuries. At the scene of the accident were dispatched two rescue boats with firefighting equipment, which should assist with extinguishing the flames. The local authorities started investigation for the root cause of the fire. The 8 crew members were rescued without serious injuries and will give their witness evidences for the investigation. The vessel was loaded with sand. Currently, there is no report for water pollution. The general cargo ship Sheng Yuan 508 has overall length of 60.00 m, moulded beam of 11.00 m and maximum draft of 3.50 m.